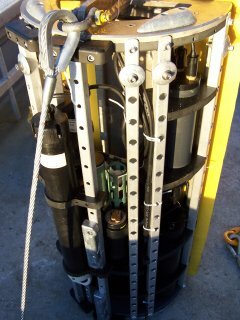 Physical measurements include temperature, depth, salinity (optional), current profiler (optional) and turbidity. Chemical sensors include chromophoric dissolved organic matter (CDOM), nitrate, and dissolved oxygen. Biological measurements include chlorophyll fluorescence with options for additional ancillary pigments. 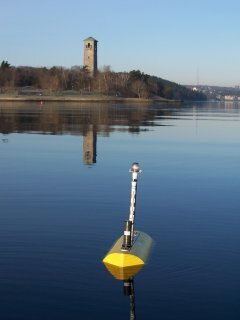 The LOBO comes complete with floating platform, power and wireless telemetry system, integrated sensor suite, automated processing software and web based data visualization and display software (LOBOviz). Just deploy the platforms, install the software, configure the system using a simple GUI, and your data is live on the web. The system is designed for both rapid deployments and long term monitoring, making it easy for users to install and operate. LOBO has been extensively tested in a wide range of extreme water quality conditions for the past three years with a network of five systems in the Elkhorn Slough National Estuarine Research Reserve. Online real-time and archived data is available at www.mbari.org/lobo/loboviz.htm. The system addresses specific resource management concerns of the NERRS, such as degraded coastal water quality, loss and alteration of estuarine and watershed habitat, habitat restoration, reduction of biodiversity, and problematic effects of pollutions and invasive species. The initial LOBO deployment has demonstrated how a real time aquatic sensor network can significantly increase our ability to address these issues and contribute to the generation of information that leads to sound resource management. The ability to study the interactions of the hydrologic cycle, nutrient chemical cycles and human alterations of these cycles at the land/ocean interface is a fundamental component of coastal zone management, and one that has traditionally been a major scientific challenge. The LOBO features a floating platform in two configurations, one for waters as shallow as 1 meter (RiverLOBO), and one for deeper waters (BayLOBO). Both are designed for deployment with a minimum of effort in small boats. Users can easily move platforms around study sites to monitor critical locations. Each uses a modular instrument bay with quick release sensor modules for easy maintenance. A minimum of exposed infrastructure and a robust flotation system make the systems resistant to vandalism, and an optional GPS tracking system is available. LOBO platforms are also available for attaching to fixed structures such as docks or pilings (DockLOBO), or for placing directly on the bottom (BenthicLOBO). A significant component of the LOBO system is LOBOviz, a data visualization and display package for an entire network of monitoring sites. This powerful tool allows users to access and view real time or archived data, comparing multiple sensors at a site or multiple sites simultaneously though a simple web interface. This gives system users rapid and easy access to the monitoring network to help make informed decisions. A new live demonstration system has been deployed in Halifax Harbour, Canada. The system uses robust, high accuracy, high stability sensors with integrated anti biofouling systems to maximize deployment time, minimize operational costs and provide high quality data sets. 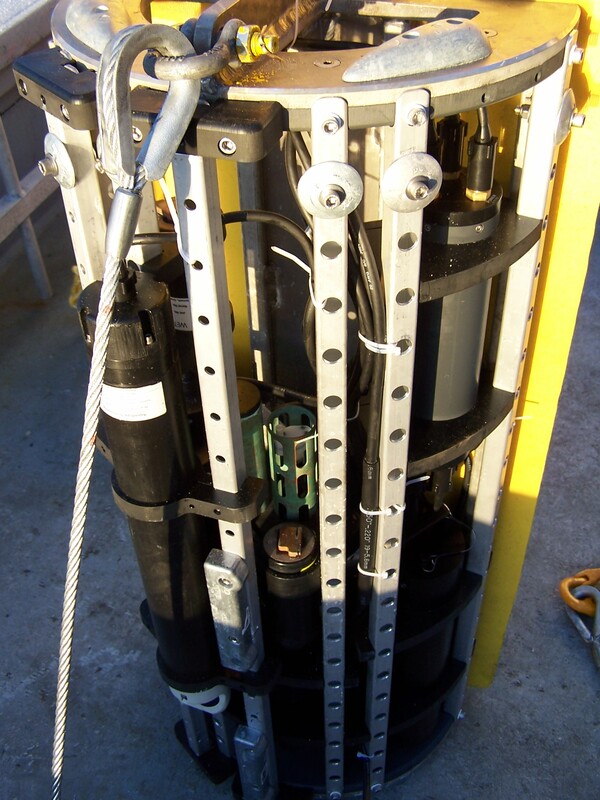 The sensor suite includes the WET Labs WQM instrument with ECO series fluorometer and turbidity sensors with integrated bio-wiperTM, integrated CT (and optional depth) and dissolved oxygen sensors with a comprehensive antifouling system (including copper cladding, a bleach injection system and a optional TBT module) all designed to greatly extend deployment times in coastal environments. The system also includes the Satlantic ISUS chemical free nitrate sensor which is pumped from the WQM to maximize antifouling capabilities. Water velocity profiles using the Nortek Aquadopp are optional.